I've been trying to leave San Diego for years. Aaaand... you're trying to reach into your computer screen and slap me. Leave?, you snap. What is wrong with you? 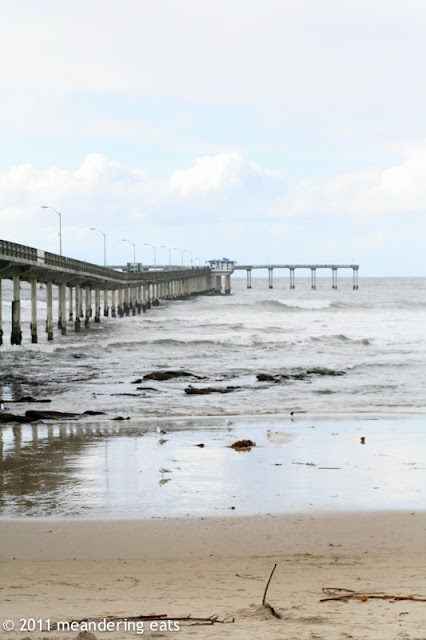 Beaches, temperate weather, beautiful coastline. 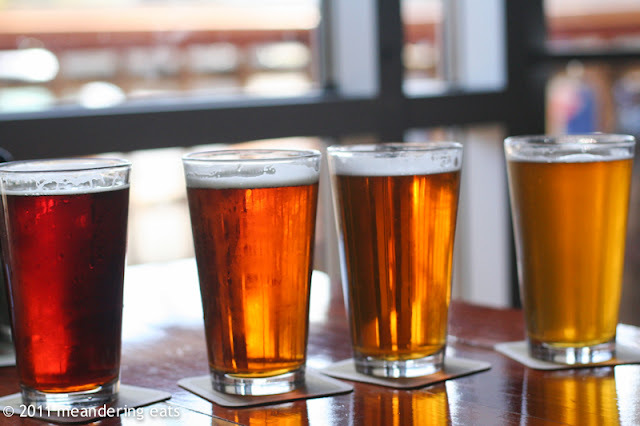 The food scene's getting better and better and the beer is world-class. So world-class that our craft brews show up in cupcakes. Year-round fresh produce. The privilege of spending November weekends laying out on the beach. Leave, you huff. Pfffft. Screw you, lady. When I arrived in 1999, I had spent 16 years of my life in inland Los Angeles County. The coastal breezes may as well have been Arctic gales to me. I lived in UCSD's Camp Snoopy back in those days. We didn't have a dining hall then (yes, it was that long ago), so we had to walk a ways to the nearest dining facility. It was one of our first nights, we were a big cluster of first-years who were many different people in high school: cheerleaders, jocks, nerds, skaters, grunge rockers, etc. The playing field had leveled and the labels were gone... we were just a bunch of freshmen, scared shitless because the fog had rolled in and we couldn't see 10 feet in front of us, let alone find our way back to our dorms in the darkness. The years passed. I had a ball at UCSD, struggled with life, fell in love, and was finally forced to join the real world by uncontrollable circumstances. I had two degrees and a job via a good friend's connection. Today, it's 2011. Still here doing my thing. Many of my friends have left San Diego. So, what does this have to do with San Diego? Nothing. It's a great place, but it's hard watching people slowly trickle out and move on. It's hard revising the life plan, which definitely didn't include staying here for over a decade. It's hard to suppress the wanderlust and the tinge of regret I feel at not having indulged it in my twenties. Which, by the way, are going to be over in about 10 weeks. Every so often, however, I'm smacked upside the head and remember how lucky I am to live here. 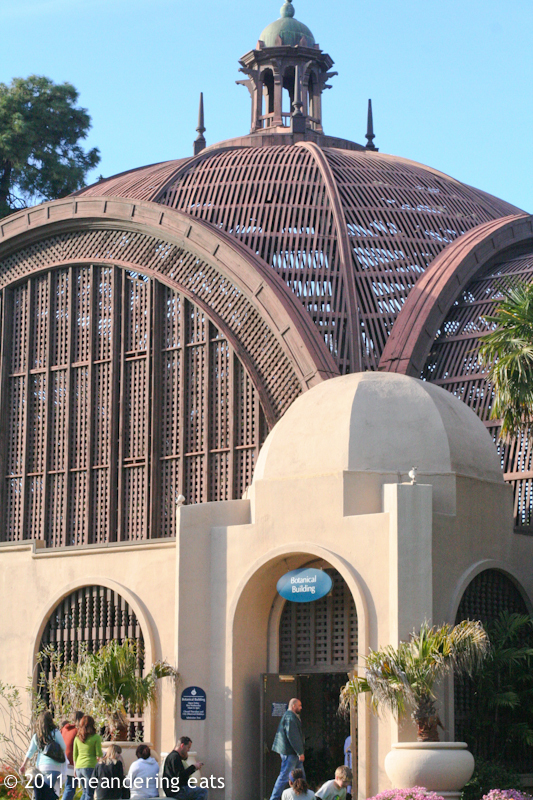 I grew up in LA's San Gabriel Valley, but San Diego is where I grew into my own. I met some of my best friends here. I met my long-suffering husband here. It's a couple of San Diego bloggers who inspired me to start writing about food. My love affair with photography and organic chemistry began here. One of those friends who trickled out, JL, brought his girlfriend back to show her around our "hometown". 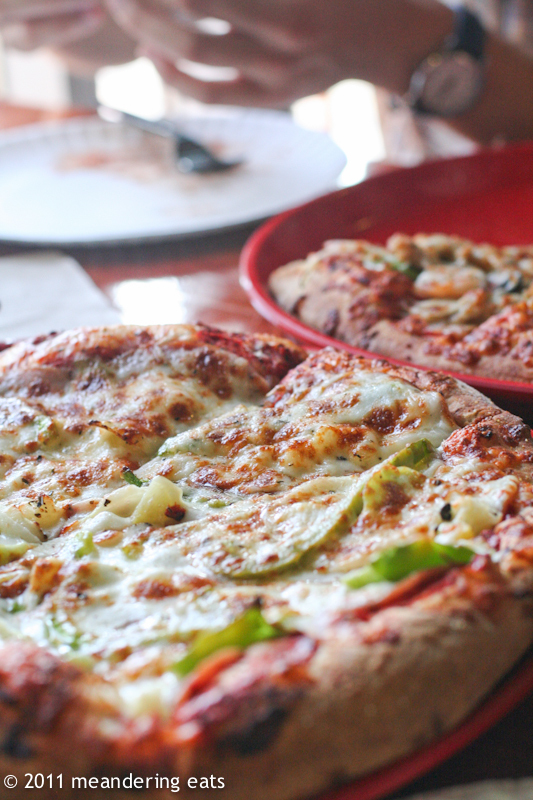 We had pizza and beers at Pizza Port's Ocean Beach location. Mmmm... beer. Accompanied by their delicious Pizza Lahaina. 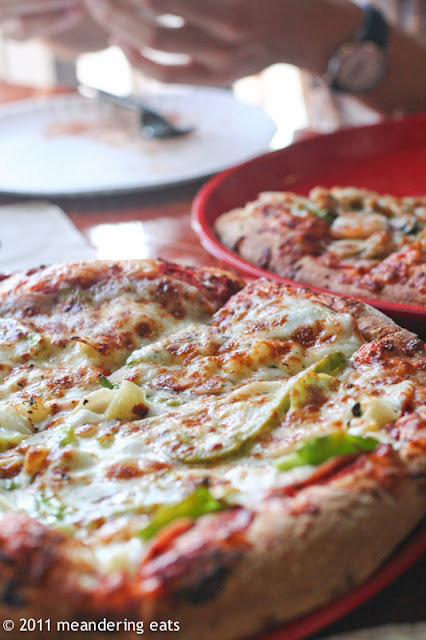 California's pizzas are all about the toppings and Pizza Port does a CA-style pizza very well. Afterward, we walked around Ocean Beach and down the pier. We headed up to the alma mater for a while, to walk around the Gliderport and watch the colorful parachutes float around against the bright blue sky. Then we drove down to Torrey Pines State Beach. The photo on the right? 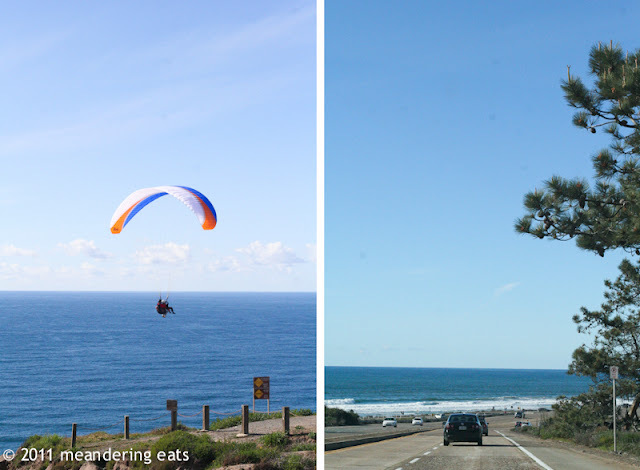 I work right off Torrey Pines Road and, when I need a reminder that life is good, I take this drive. The view is unparalleled. 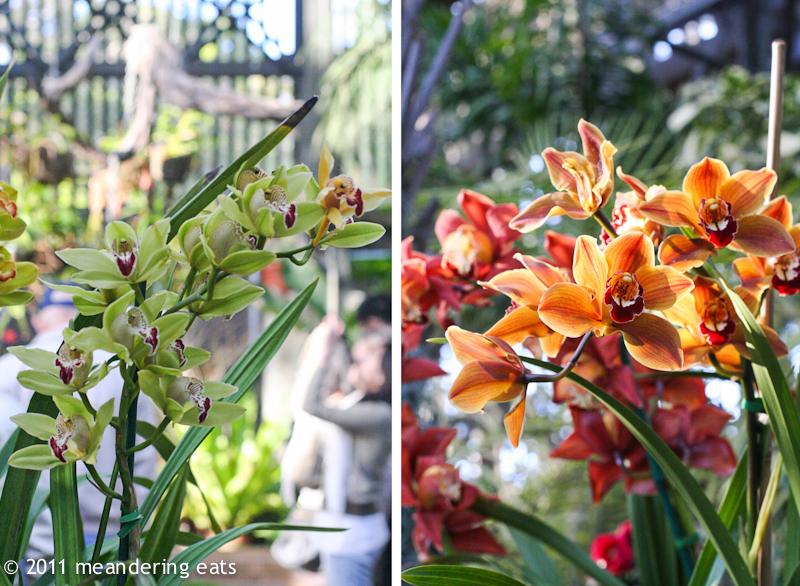 We headed to Balboa Park, where the botanical garden had a display of orchids. It was a nice day that day and tons of people were roaming through the park. The orchids were stunning splashes of color that contrasted the dark greens and browns of the existing greenery. I love the touch-and-smell section. 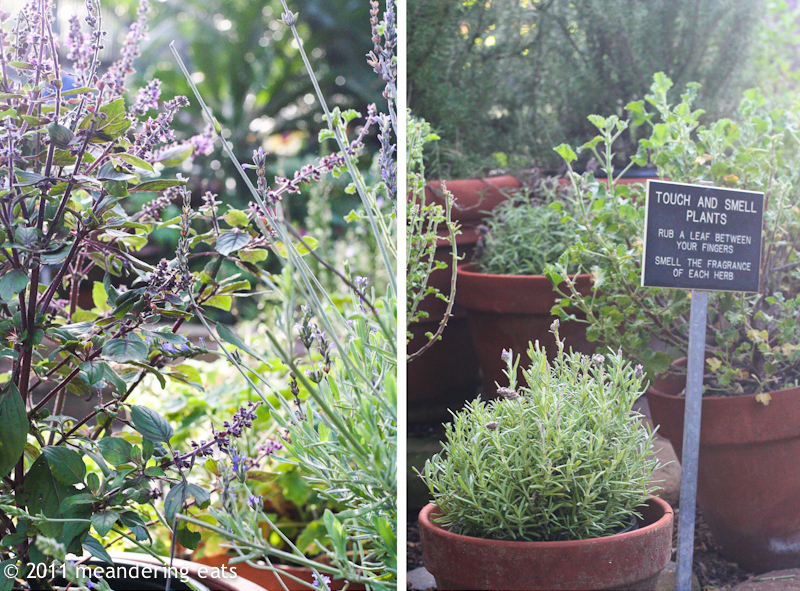 Fresh herbs such as lavender, several types of basils, and rosemary weren't colorful, but they smelled amazing. Ah, San Diego... I'm an idiot for wanting to leave you. For more San Diego exploration, join me on Saturday, April 16, at Taste of Hillcrest. Look for a recap post coming soon! man, i def. miss sd. i was hoping to get an externship down there for the summer, but sadly didn't get it. def. let me know whenever you're up here though, so we can get some food! Yup, it's Roosevelt now and 6th College is currently the unnamed one. Yay UCSD! Hahahaha, yeah, I lived in the new ERC dorms my 5th year as an RA. It was dangerous having both Cafe Ventanas and OVT so close! Awwww... I'm sorry to hear! For sure, we'll get some food when I'm up north! 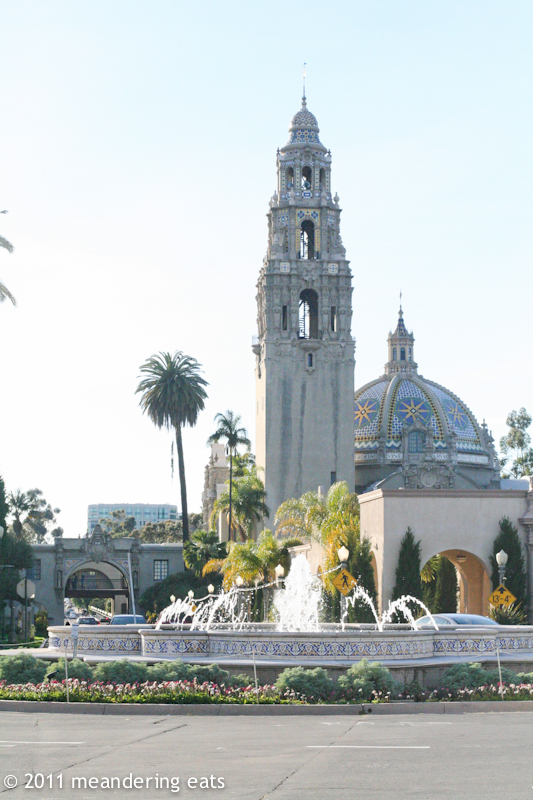 It's a great place and Balboa Park is especially great. :) Thanks, CC! My boyfriend lived in Camp Snoopy! I know exactly what your talking about. They have a dining hall now but its no good, everyone still treks to other ones :) Chrissy and I were in Marshall w/ OVT open till 1am...i gained some serious weight. maybe the lack of dining hall was a good thing for you! Lovely post. Hmmm...I came here in 99 also. I wonder if we ever crossed paths. I was in Muir. I know what you mean about people leaving. Most of the people I met and made friends with have moved on and I'm still here, which I never expected. I graduated from UCSD too, but never lived in Camp Snoopy - I was right next door in the 5th apartments (I guess it's Roosevelt now? ), but I was there before you. I left in 1993. And I also love Pizza Port! Hi M, i'm probably biased because I'm San Diego born and raised butI really do love it here. We have great weather year round and we don't suffer from gridlock on the freeways like in LA. The smog isn't as bad either! 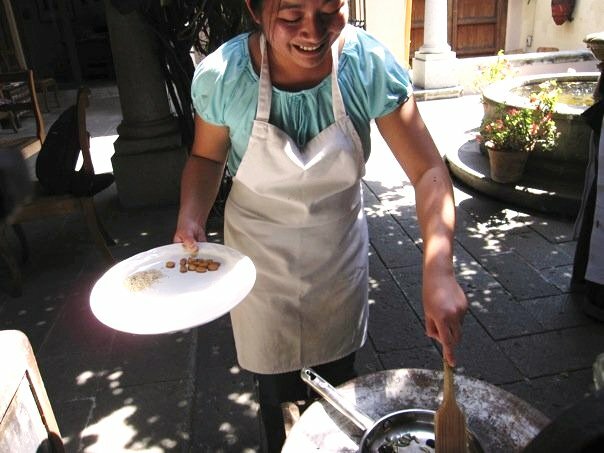 There are lots of cool neighborhoods to explore as well as eateries to discovery. Hi, I'm new to SD, blogging and your blog :). This was a great post. I moved from a place buried under the snow for many months and this weather sure is a treat. Just y'day I tried a few beers at the Yard House in downtown...and loved the collection, not to forget the food. I will definitely visit Pizza Port sometime! Thanks, Snehal! Looking forward to meeting you in a few weeks!